CARLTON veteran Kade Simpson says he is "yet to see a weakness" in No.1 draft pick Sam Walsh. As Simpson put a positive spin on the Blues' off-season injury list, he also praised recruit Will Setterfield and said he expects the former Giant and Walsh would be key members of the midfield from Round 1. "I'm yet to see a weakness, to be honest. 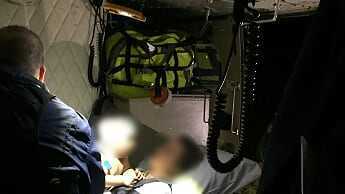 He's a serious athlete," Simpson, 34, said of Walsh on Monday. "I think one thing that he's got that a lot of young guys learn is he's not afraid to push himself to the absolute limit. On the training track he's up the front of all the running drills. "He's got explosive speed away from stoppages, an amazing lateral step, and he's just a ripping young fella. "I'd be excited if I was a Carlton fan because he's going to have a very long career. Asked if Walsh would play early in the season, Simpson said: "I think so, yeah, he's been really impressive on the track and I think he'll slot very nicely into our midfield." He said Setterfield, who has played just two senior games since being drafted in 2016 due to injury, would make an ideal partner for new skipper Patrick Cripps. Sam Walsh (centre) and Ed Curnow (right) lead a Blues running drill. "He's really impressive, really clean hands, similar to Cripps the way he'll take the tackle and get his arms free to feed off to guys on the outside, that's probably his big strength. Having him work with Crippa is going to be exciting." And Simpson played down the impact on player morale of a long injury list that includes Sam Docherty, Mathew Kreuzer, Mitch McGovern, Jarrod Pickett and Alex Fasolo. "To be honest, it's It's energised the group," he said. "A lot of guys have seen it as opportunity for them to stand up and consold a position." Simpson's praise of the young Blues midfielders comes a day after fellow veteran Ed Curnow said the club can be "very competitive" this year if their crop of young rising stars can take another step forward in their "natural growth". 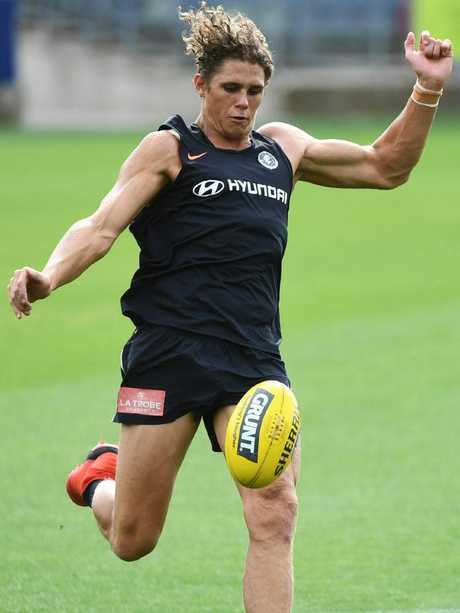 Part of Carlton's five-man leadership group this year, Curnow said the side would be relying on players like Jacob Weitering, Charlie Curnow, Harry McKay and Sam Petrevski-Seton to help it climb the ladder after a wooden spoon finish to 2018. Curnow said there were no expectations being put on the season but there was also no ceiling to what the side could achieve if those players could take major strides forward. "We really want to develop competitive habits from the players and to see individuals grow and improve and see guys step up and step into leadership positions," Curnow said. 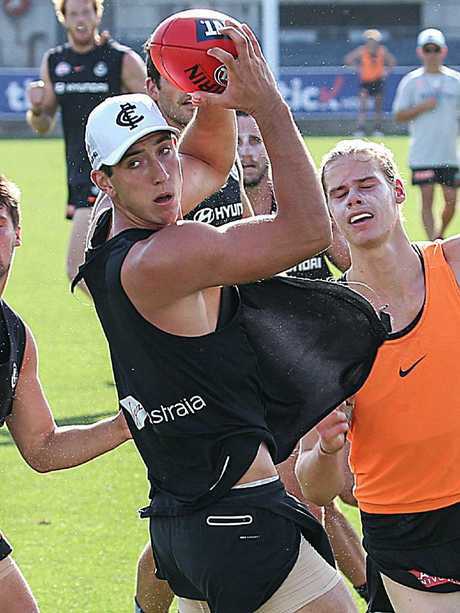 Charlie Curnow in action at Carlton training. "I think guys like Weitering, Charlie Curnow, Harry McKay, they're into their fourth year now so we really want them to step up and take the club forward this year. "We're really looking for players like that to then bring along the Sam Walsh and Zac Fisher and Sam Petrevski-Seton's. "So I think we'll get a lot of natural growth out of those guys with just another year in the system and that will make us very competitive." 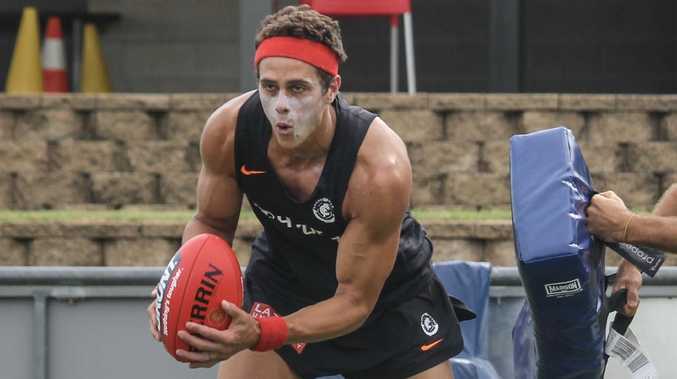 Carlton landed on the Sunshine Coast on Sunday for a week-long pre-season training camp where they will ramp up preparations for a Round 1 game against Richmond, which is now just 45 days away. Curnow said recruits McGovern and Setterfield would also be vital this year, with former Adelaide swingman McGovern continuing his push to return to full fitness after a suffering a non-displaced fracture of his back in the last training session before Christmas. "He's got a great vibe about him," Curnow said of McGovern. "He's quite confident and relaxed so he gives a lot of confidence to his teammates and he's obviously a star as well so I'm looking forward to seeing him out there." Carlton faces Essendon in its first pre-season match on February 28 at Ikon Park. premium_icon AFL SuperCoach top 40: Who is this year’s best buy? premium_icon Ben the next midfield bull?